A plan had been designed by local architect Bert Bender for the extension of the Village into the Truman Waterfront, the 33-acre parcel donated to the City by the US Navy in 2002. Bender’s plan was both bold and conventional. It extended the Village’s traditional street grid, but also had some unique features such as green space on the rooftops and mixed commercial space with affordable housing in a single structure. Everyone seems to have liked something about the project. However, after hundreds of hours of community input and with fully designed architectural plans, the dream of extending the Bahama Village neighborhood into 6.6 acres of the Truman Waterfront looks as though it might remain just that: a dream. In fact a recent email from Doug Bradshaw, the City’s Project Manager, has brought the issue close to the flashpoint. “There is no such thing as a 6.6 acre parcel anymore. What remains and what BVRAC discussed was the 2.6 acre parcel that is part of the TIF District,” says Bradshaw in a January 8th email to a member of the Truman Waterfront Advisory Board (TWAB). Now let us decode those cryptic words for you. In 2007 a majority of voters approved a referendum reserving 6.6 acres of the Truman Waterfront for the economic benefit of Bahama Village. 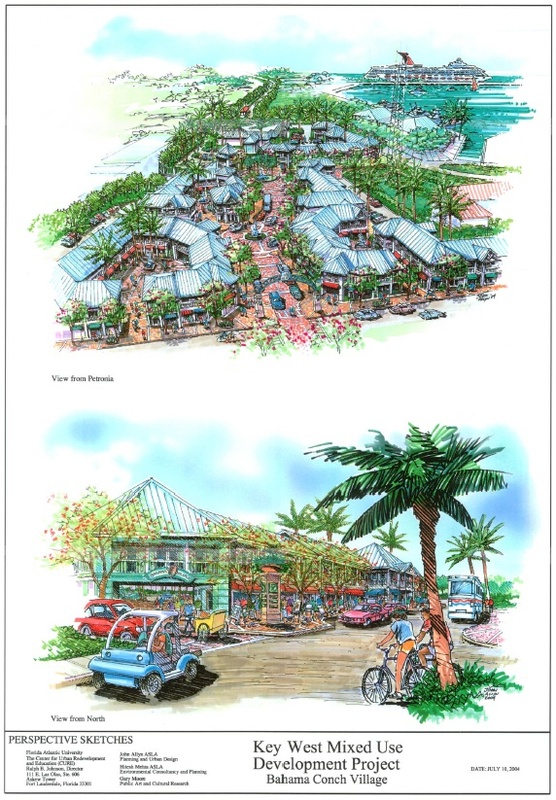 A non-profit called the Bahama Conch Community Land Trust (BCCLT) conceptualized a vibrant Bahamian community which would offer jobs, small business opportunities, vocational training, affordable housing and recreational space. But apparently, seven years and a whole lot of politics later it seems that the mandate of the people has been lost. The irony in what some perceive to be a concerted effort to dispossess Bahama Village of its share of the Truman Waterfront is that the Village was one of the main reasons the Navy gave the Truman Waterfront to the City in the first place. The following is the argument used by the City to convince the Navy to donate this multimillion-dollar waterfront property. It gets better. When digging into the history of the City’s creation of the Key West Bight Historic Seaport one realizes that again it was Bahama Village that made the acquisition and subsequent redevelopment possible. That scheme is worth describing in detail. In 1991, the City had just decided to play developer and wanted to buy Key West Bight and develop it into a marina. The problem was that normally a City can’t use taxpayers’ money, including local, state and federal funding, for what are essentially non-governmental purposes like running a marina with shops and restaurants. There is, however, a loophole: Call it a “slum” or “blighted area” and create a CRA (Community Redevelopment Area) and then not only can public money be used for “private purposes” but tons of grants become available, even to private businesses within the CRA. Thanks to this very savvy maneuver, grant money would rain on private business at Key West Bight. For example, the “Conch Farm”, claimed it would to be importing thousands of live conch from the Bahamas and promised to create jobs in the “conch-farming industry”. In reality, even at the very top of their ‘conch production’, there would never be more than an aquarium with four or five live conchs, but thanks to the CRA, the famous bar/restaurant would receive over $700,000 of free money from the state for the construction of its parking lot alone! And Bahama Village? Well, not long after the CRA was approved, the City Commission decided to use separate accounting for the two neighborhoods; one for the Bight and one for Bahama Village. 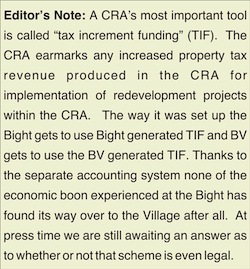 That move had a cynical result: increasing revenue in the Bight could not [after all] be used to fight the blight in Bahama Village. Over the course of several years of bureaucracy and politics the initial 7.78 acres destined to provide an economic engine for Bahama Village would become 6.6 acres. 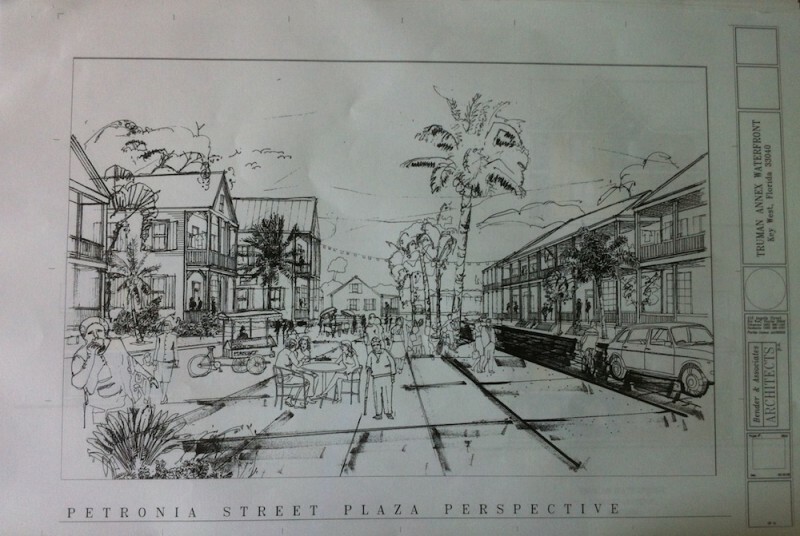 A few weeks before the City would sign a 99 year lease with the BCCLT to develop those 6.6 acres, Norma Jean Sawyer, the indefatigable leader of the Bahama Village redevelopment movement would be thrown in jail for having crisscrossed funding from various grants she was supposed to manage and finally, last month, the City announced that the 6.6 acres has completely vanished from the plan. We sat down with architect Bert Bender who, back in 2009, designed the Bahama Village [6.6 acre] portion of the Truman Waterfront property. Out of the mass of blue prints, elevations and renderings, a remarkably integrated plan materialized. Bender is passionate, almost a Picasso look-a-like. He has put some of his own experience as a kid growing up in inner city Chicago into this urbanization project. It would be hard to miss his disappointment at the lost opportunity, the rare chance for an architect to design more than a facade, and actually have an opportunity to design a better world. It is hard to imagine who would want to stand in front of that train. Blue Lagoon Children: A Hard Landing Into Key West’s Racial Divide Sunken Tug Tilly Could Cost Half-Million Dollars! Why Was Nothing Done?